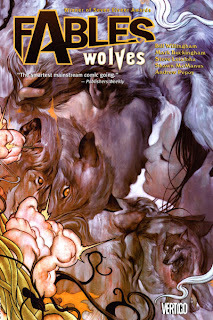 This book is volume 8 in the Fables series, and as such there will definitely be spoilers for previous issues, even more so than usual because I really, really loved this instalment. It may even be my equal favourite of all of them so far! You can read my reviews of the previous books in the series here. This is the book that I have been anticipating for the last few instalments because, finally, Bigby Wolf is finally back! And I can tell you that I did cheer when I realised! As much as I have enjoyed exploring the other fables worlds I was so pleased to see that this volume was so much more focused and that Snow White and Bigby were front and centre. The first story is called Wolves and features Mowgli travelling the world searching the world for Bigby Wolf - a man who really doesn't want to be found. From the Russian seaports, Mowgli is almost ready to give up until he realises that he needs to stop thinking of the man he is searching for but rather think of the wolf that he is tracking. Bigby has been trying to forget the past he left behind, including the woman he loved, and if he has to do it by living in the isolated forests, by drinking too much and consoling himself in any way he can then so be it. Mowgli is however determined, mainly because Fabletown has a task that only Bigby can fulfil - ensuring that the Adversary gets some retribution for his actions against the Fables. The fact that this task may provide the means for Bigby to see both Snow and his cubs again is also a major factor of motivation. Snow and Bigby have been separated for years because he is banned from going to the Farm and Snow is forced to live there until such time as her children can show that they can maintain a human form and therefore go unnoticed in the mundy world. The final section of the book moves away from Bigby and instead focuses on Cinderella. In Big and Small we find out that Cinderella isn't just the owner of a high end shoe shop, but rather that she plays an important part in the diplomatic work related to Fabletown. I loved the fact that we got to see some magic beanstalk action in this novel (and no that isn't a euphemism) and enjoyed visiting the cloudlands, especially as Cinderella tries to get a major peace treaty signed before the kingship changes hands AGAIN, but for me the undoubted highlight of this book is the culmination of Bigby and Snow's relationship. It was interesting that there was a full script of the novel included in this editions, which I don't recall seeing before. By following Kailana's handy dandy guide to the Fables series, I see that now I need to read the stand-alone volume 1001 Nights of Snowfall. I only wish that I didn't have to get every volume of this series through inter library loan. I get very impatient waiting for each new volume to arrive! If you have any interest in fairy tales, even if you do not normally read graphic novels, I highly recommend this series! As you would expect, it is best to start at the beginning to get the full effect! The community of Fables living undercover in our midst has endured plenty of suffering at the hands of their longtime antagonist, the Adversary. Now it's time to return the favor and put the would-be conqueror on notice that the cost of subjugating this last stronghold of independent magic will be higher than even he can bear. The one Fable who can accomplish this mission, however, has hidden himself away in the wild and will take some convincing if he can even be found. Luckily for Fabletown, there's something more than a trip behind enemy lines awaiting Bigby Wolf's return. You are zipping through these. I still haven't read 1001 Nights. I'm going to read it when I finish the Jack books. This was one of my very favorites in the series. I love Bigby.